This image of the WayMaking Cairn (WMC) was taken in late January 2015, just a stone’s throw from the Little Calumet River. As I’ve menioned in earlier posts, the WMC is one of many images in a subset of my contemplative photography work. It serves as an avatar-like manifestation of my spiritual engagement with my surroundings as I walk. In anthropological terms it serves as participant-observer in the environment where the shot was made. 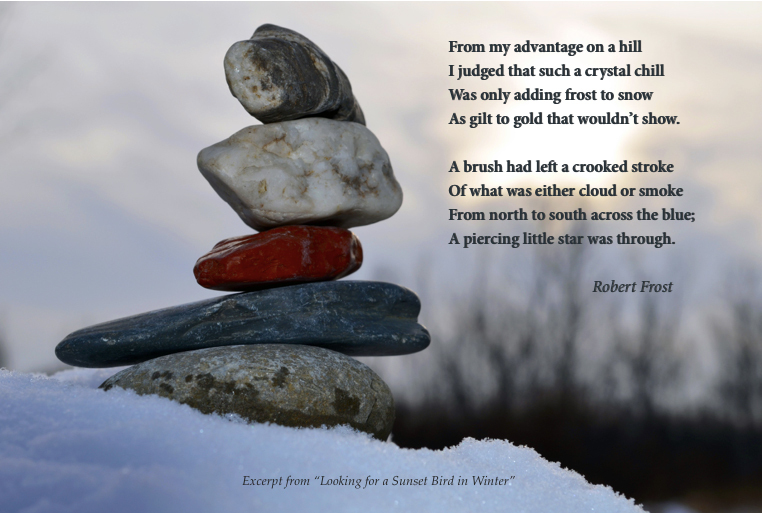 The excerpt from Robert Frost”s poem “Looking for a Sunset Bird in Winter” created a rich dialogical exchange between the image and the text.